ANAMIKA: Relax everyone, Olivia is fine and has been drinking the world’s best wine on an island that can only be described as paradise. Am I the only one that saw that coming from a mile away? Sure Olivia’s family is all messed up, she’s in love with the president (the WORST president in real and fictional America) and she knows things about the republic that no sane human being should have to deal with. BUT I’d say life is pretty good for the fixer. She’s on a gorgeous island with a gorgeous man. Why did you have to mess it up and come back to Washington, Olivia? I thought the OPA alums would be a little more understanding about Olivia’s decision to get away from it all but it made room for the single-breath monologues that define this show (which, for the record, I really hate). It was great to see Olivia take on a case during her stay. It was reminiscent of when Scandal was more of a procedural – those were simpler times. 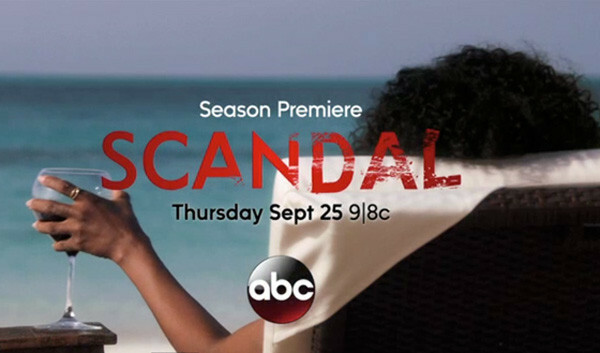 But the sickening twist in that plot was a reminder that Washington is twisted, but Olivia can’t stay away. Finally, kudos to Olivia for not running to Fitz. I know it’s temporary but I’m going to enjoy it while it lasts. David? DAVID: I actually wasn’t sure where Olivia was going at all – I kind of decided to let it be a mystery in my head. I’m a huge Jake fan (I know, I know, he’s a murderer, whatever, so is everyone on this show), so it was nice to see the couple enjoying some happiness for a little bit at least. I loved seeing where the rest of OPA ended up – Abby as press secretary was a great twist. Poor Huck – err, Randy. What has Quinn been up to though?! I don’t trust her for a second. Side note: not as upset about Harrison’s death as I thought I’d be, even though there was a significant amount of screen time about it. I guess he wasn’t really that pivotal of a character. ANAMIKA: I don’t care if this show is on a slow, downward spiral or if Fitz is president or anything else. If Jake Ballard (Scott Foley) is in at least 50 percent of the episode, I will watch. Shonda Rhimes definitely pushed the boundaries with the network with some of his lines (and actions) in the premiere. I hope he gets more substantial plot lines and isn’t just window dressing this season, but I’m #TeamSun all the way! DAVID: Totally agreed. I could honestly see Jake getting paired romantically with Quinn or Abby in some strange twist – or maybe even a Mama Pope tryst underground. #Scandalous #getit? ANAMIKA: News flash: Fitz is actually doing his job now! And he’s angry…or something. Argh, I find it so hard to care about Fitz these days. As Mellie would say, I can’t even put my back into it. I was so worried he was going to show up at Harrison’s funeral. Thank god he didn’t. DAVID: As much as I don’t like Fitz, I really feel for the guy. Losing your son like that is something no parent should ever have to go through. And his apparent suicide attempt only makes it that much more painful. I do not appreciate him lying to Mellie though, because he is totally going to see Olivia and bang her promptly. Just saying. Side note: I hope we get to see more Cyrus than we did in the premiere, because I enjoyed his banter with Portia de Rossi’s character. This show has an excellent casting department. ANAMIKA: Since this is our first “Scandal” post, we should let our readers know that Binge Central is a #TeamMellie zone. Even as a heartbroken, alcoholic mother wearing Uggs and a silk robe, she seems to be the only one with her head on her shoulders. She can see through everyone’s bullsh*t and that’s what I love about her. That scene when she and Fitz visit their son’s grave was heartbreaking, especially from a character that is supposed to cold and not maternal. DAVID: #TeamMellie forever. All the time. Every day. She should’ve made that state fair prize speech from last season, because Fitz needs to earn her respect. I am truly hoping the series ends with Mellie as president.